Biotique Scrubs - Worldwide Shipping. Deep-cleanse skin & purify pores. 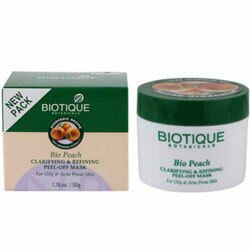 Refines skin texture, clears way for lighter, brighter skin. Peaches have been cultivated for thousands of years, a natural clarifying and curative fruit, especially for oily and acne prone skin. Their peelings and antioxidant-rich fruit have long been used to renew and resurface skin.